Just about everyone picks up a camera at some point in their lives and clicks off snapshots. For some individuals the passion for capturing moments in time through the lens of a camera evolves to a profession. Ada and Allen Lester are two such people. Both grew up with a camera at their side and even on their honeymoon were accompanied by the world's first auto focus 35mm SLR camera. This passion for photography lead to the creation of TriDuo.com which specialized in action sports photography. Sports photography offered numerous challenges with fast moving participants, dark conditions, ever changing light and limited reaction times. Ada and Allen quickly discovered that the photographic skills honed through years of action sports photography were the perfect match for successful wedding photography. Yes, brides move, churches are dark and everything is fast paced! In the fall of 2004 Chris Downing joined our family. Chris' background included portraiture, weddings and still life. Chris agrees that sports photography improved his "eye" for capturing your wedding moments. It has been a marriage of traditional photography techniques with the skill set of split second timing for action shots. 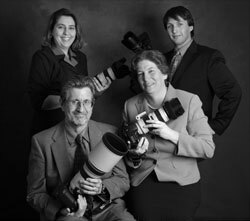 Our team encompasses memberships in wide array of professional organizations including the Professional Photographers of America, Society of Sport & Event Photographers, Canon Professional Services, National Press photographers Association, SportsShooter.com, and Editorial Photographers.com.